Treat the immigrants living in your area as if they were born there too. Love them like you would want people to love you if you were a foreigner. One million new legal immigrants arrive in the U.S. annually and they need a friend. 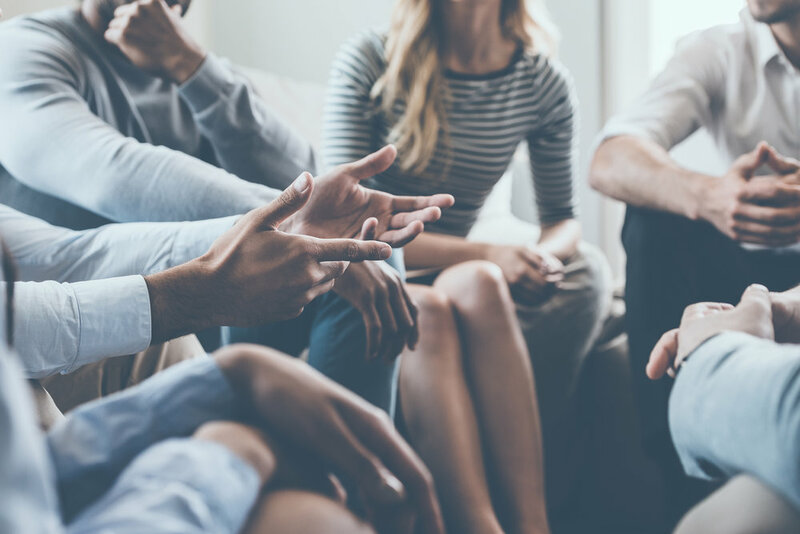 The foreign newcomers in your town desire to learn English and be better known in their new community. They desire friendship and acceptance, and they want to share from their language+culture. They want to assimilate without losing the richness of that language+culture. As a believer, you are called to welcome these newcomers by getting to know them better and sharing with them the gift of salvation. The 19:34 Project is building a bridge. A Bridge Between Languages + Cultures. The Bible can have a greater influence on an immigrant’s life if it’s in the language they know best. But YOU also need the Bible in the language you know best to read it with them. A two-language Bible is just that, your language on one column and their language on the facing column, with verses and sections perfectly aligned for reading passages together—in both languages. What better way to introduce your new neighbor to Christ, than through the language they are most familiar with—their own. Immigrants and refugees want to preserve their dignity, identity and respect. The Bible says a lot about these inherent human values. There’s a place between your language and theirs to meet in, and there is a two-language Bible for that—one that speaks your language+theirs. THE 19:34 PROJECT is that bridge. which language does your neighbor speak? There are about 62 million people who speak a foreign language in the US. Over 350 languages are spoken. Chances are, there is already a Bible translation in all of those languages. In fact, there is a New Testament in 670 of the worlds languages. But which language does your neighbor speak? Bless them with a Bible you can both read together. Check out the graphic below to see just how T H E 19:34 P R O J E C T is eliminating the language barrier and already building bridges today. A nation that Christians call home should be many things, and foremost among those is welcoming and hospitable. The book of Leviticus commands God’s people to be this way in saying, “Treat the immigrants living in your area as if they were born there too. Love them like you would want people to love you if you were a foreigner” (Leviticus. 19:34). Relocating in the US can provide a better life for immigrants and refugees, but that doesn’t mean resettlement is easy, in fact the change can be dramatic. It means they’ve been completely uprooted with loss of homeland, and for refugees, loss of everything. Our new neighbors are separated from family+friends and are lonely, they feel vulnerable and unknown in their community. What’s worse is often they are targets for exploitation. Immigrants can be marginalized, unvalued, and misunderstood. It is difficult to maintain dignity and self-worth. 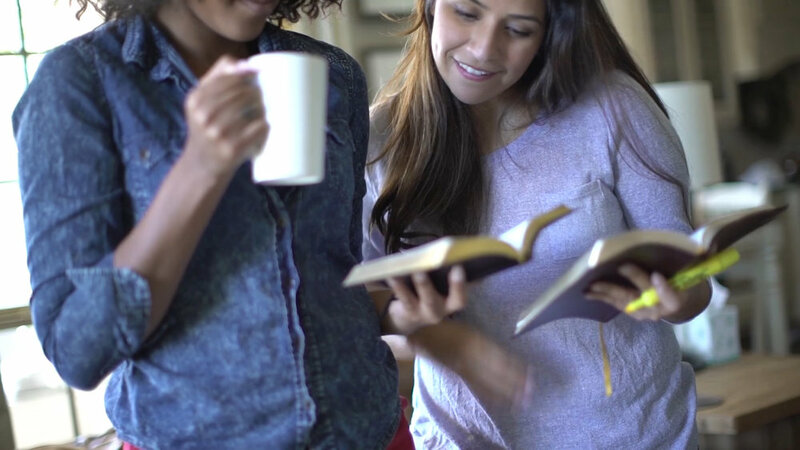 The personal relationship Christians pursue with Jesus Christ is reproduced when two people connect around two languages in one Bible. Both benefit. we have some answers. . .
Q: What if they don’t speak English? A: The two-language Bible will help them begin to in their language and yours. Q: What do I share with them in the Bible? A: We recommend starting with areas immigrants struggle over, such as what the Bible says about foreigners, identity, dignity, friendship, and value. Q: How do I find the best passages for addressing their needs? A: Search Google for Bible passages references resources on depression, fear, dignity, identity in Christ, and welcoming foreigners; things like that. Q: Why shouldn’t I just use a Bible App? A: Bible Apps can’t align two Bibles in one App. 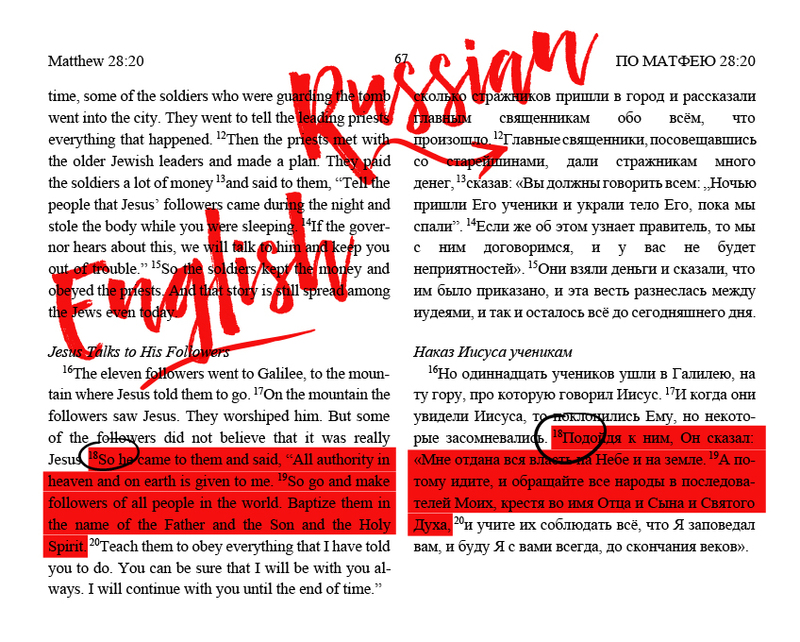 Using two Apps still makes it cumbersome to look at both languages and compare verses and sections. Even in the digital age, a printed two-language Bible is a tangible tool for that sharing space. It’s something you can leave with them.